This weekend was the Alt.Net.UK conference in London and I’m really pleased to say that it was a huge success. A huge thank you to everyone who attended, I think the official count was 53, as it was you guys who made it the success it was. Another huge thank you goes to Michelle, Sam and Danni from Conchango who was on hand throughout the day providing food, drinks and generally being great! Another huge thank you to Red Gate who put money behind the bar on the Friday night and providing three licenses for the .Net Developer Bundle, CodeBetter for sponsorship and finally TypeMock and Roy Osherove who provided three licenses for Typemock Isolator Enterprise Edition. On the Friday, the evening started with a quick welcome and everyone introducing themselves to the group, it was great to see such a wide variety of backgrounds and technology sectors. After everyone had been introduced, people suggested sessions which they would either like to attend or would like to speak about. Most of the sessions where based around MVC, Rest, TDD, ORM, DSL so had a good mix for everyone to get stuck into. In total I think we had about 80 sessions suggested with some topics which I really wasn’t expecting, but interesting non the less. 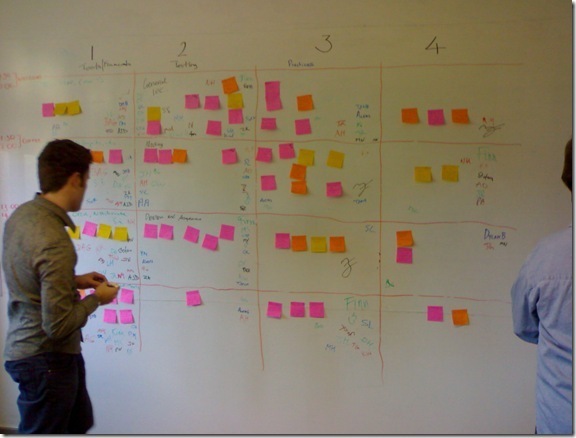 All of the sessions where put on post-it notes, stuck onto a whitewall and generally put into loose categories. After this, we went to the bar. This was a great chance to unwind and get to know everyone in an informal way. There was a great atmosphere, the tab lasted a while and everyone appeared to be really enjoying themselves and have some great conversions over a couple of beers. 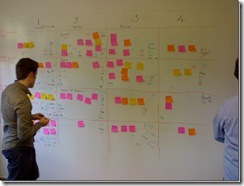 I had some interesting chats with Red Gate users, what they like and areas we could improve. A very good night indeed. Saturday was the main day of the conference. I had a little trouble getting started due to one to many beers the night before (Will I ever learn? ), but all of the sessions where allocated rooms and time slots, a quick cup of tea and we broke off into sessions. The conversation quickly got started and everyone was sharing their views on topics such as REST vs SOAP, IoC, TDD, Dynamic Languages and coding standards. Though out the day there was an amazing buzz, everyone seemed to be enjoying themselves while in the breaks I had a good chat with various people around the place on some really interesting topics. From the people I spoke to, everyone said they had a great day and were really pleased that they had the chance to attend. Once it was over, we went to another bar to continue the conversation. The conference will never be a replacement for the more traditional events such as DDD, but it’s great to have a chance to sit down with like mined people, have a few beers and talk about what’s important to you and just see what everyone else is doing. I had an amazing weekend, really enjoyed meeting everyone and I’m really happy to have been a part of it.